Sure, five pound bass and fat rainbow trout may be the “stars” of the fishing world, but crappies are the sentimental favorites among an elite group of die-hard anglers of every age and description. And while bass fishing normally requires some degree of casting skill and fishing know-how, a kid with a cane pole, a minnow, a hook, and a bobber can outfish his elders for crappie on some days with just a little bit of luck. What is it about these crappie that make them so irresistible? It’s not their size, even though a big one is a nice fish, they can’t compete with bass, walleye, northerns, muskies, or even catfish in the size department. And while they can put up a fair tussle, and must be handled gently so their “paper” mouths don’t tear free, they don’t jump out of the water and make strong runs the way a bass does. And they aren’t likely to take out much line or pull out the drag like a big northern. But gently lifting a big “slab” crappie into the boat is still a real thrill, and enough excitement to get an angler “hooked” on crappie fishing for life. Then, of course, there is the taste of crispy crappie fillets! They are a delicacy that you won’t find in fish markets, and a good case can be made for them being the cleanest, mildest and tastiest fish you can catch. They sure rank right up there with walleye in taste, and leave bass and catfish far behind. I’m sure part of the appeal is the simplicity. Sure, some crappie pros use high-tech electronics, but the basics are things that even a kid can master. And this simplicity brings fishermen of all ages and skill levels together in a fishing adventure that seldom disappoints. 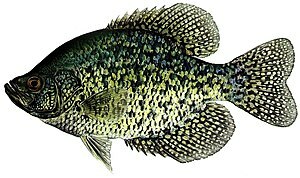 Crappies can be found in almost every state and every pond and lake. They can be caught year round, morning and evening and during the day. They can be caught from a boat or from the shore. This entry was posted in Crappie Fishing and tagged Catching Crappies, Crappie Fishing, fish, Fishing Panfish, Guide Fishing. Bookmark the permalink.